Installation of the rugged and versatile Touratech Folding Mirrors is quick and straight forward. Watch as Iain walks you through it! Iain with Touratech U.S.A. here, and these are the folding mirrors that we make. These mirrors fit a whole bunch of motorcycles, but today we’re going to be installing them on a BMW F850GS. You’d think mirrors are really easy to install, and you’d be right, but there’s a couple neat tips I’ll give you that’ll make the installation go a lot smoother, and make them work better on your bike. 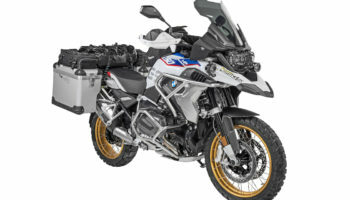 To start the installation of the folding mirrors on the F850GS, you’re going to pull up on the rubber isolator that covers all the mounting bolts for the mirror, and you’re going to loosen the lower of the two nuts. That’s the one that actually screws the mirror adapter into the perch. The upper nut is just a lock nut for the mirror shaft itself, and it’s actually a left hand thread, so that ones not going to do us any good. You’ll notice on this mirror, this side is cut higher than this side. That way when you’re folding the mirror, it will stop above the hand grip, but when you’re folding it in, when you’re putting it away, it’ll fold all the way down against the handlebar. If you look real close here there’s two little letters. This says LH for left hand and on this side it says RH for right hand. This is the left hand side of the bike, so rotate it until LH is showing, and then turn the lock nut down, and use a 17 millimeter wrench to tighten it up against the bike. Now that we have the mirror installed on the left hand side of the motorcycle, we have the letters LH showing here, so we know the base of the mirror is in the correct position. We’re going to have to grab the mirror portion and just spin it around so it’s facing the right direction. Now we can fold the mirror down and check to make sure we’re happy with how far above the handgrip it rests. One neat thing about these mirrors that’s kind of hard to describe in text is that they’re adjustable for the height that they stop at above the handgrip. This is adjusted to be in the lowest possible position, and you can always just move it up one click and leave it there, but we can get a little bit more fine on the adjustment. You’ll notice here on this plastic screw head that there are two little dots. If the first dot is lined up here, that means that the mirror is in its low position. If you want to move it to the higher position, what we have to do is loosen the metal screw on the backside, and then push the screw through, turn this assembly until the second dot is lined up, and then tighten it up again. What that does is it moves the ratchet mechanism to a different position, so that the mirrors will come to rest slightly higher off the hand guard. Now we have the second dot lined up, so we just need to tighten down the screw on the backside. Now that we have this mirror adjusted to the second dot, you’ll notice that the resting point of the mirror in its lowest position is slightly higher off the handgrip. The only thing to keep in mind is when you’re installing the mirror on the right hand side of the motorcycle is that you make sure that the letters RH for right hand side are showing. If you’re going to change the position of the ratchet on the right hand side mirror, be aware that the metal screw will be facing the rider, and the plastic screw that has the dots on it will be facing forward on the motorcycle. Now that your Touratech folding mirrors are installed, make sure that you take some time to aim them appropriately so that you can see everything you need, and don’t forget to fold them in when you go riding off road. You want to make sure you get those guys out of the way, so they’re not hitting bushes and they don’t break when you fall over. These mirrors are a great addition to an adventure bike that’s going to be used on the pavement and off road. Be sure to visit our website if you want to learn more about products we have available for your bike. That’s Touratech-USA.com, and visit us on social media. Let us know how the mirrors are working. Tell us about your rides.